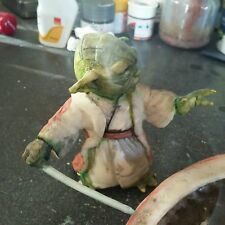 Vintage Star Wars ESB 1980 Yoda LFL Fundimentions figure statue. Condition is Used. Shipped with USPS First Class Package. 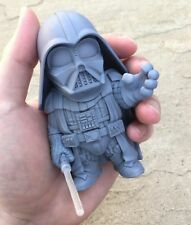 Unpainted resin kit of Darth Vader from Starwars. About 4" tall. These are original USA made 1980's and 1990's Screamin' Kits. Not cheap foreign knock offs. Darth Vader kit features Kit# 3200 1992 Production Pics are of the actual kits. 2 Sheet Steel Model Kit. Assembled Size: 4.00" x 2.00" x 3.50". KOTOBUKIYA STAR WARS SAGA SERIES LUKE SKYWALKER (EP.5 VERSION) STATUE “ DISPLAY PIECE ”. KOTOBUKIYA LUKE SKYWALKER SOFT VINYL MODEL KIT. This image of Luke is taken from the climactic light saber battle on the Cloud City of Bespin, where Luke must face Darth Vader and learn the truth about his lineage. A BIT OF THIS & THAT. HAN SOLO STORMTROOPER VERSION. THE BLACK SERIES. Yoda models. Resin. Assembly required. Hands and lightsaber need attached. Fun to paint. Have a little Jedi sitting on your desk. Not a toy. 3.25 inches tall. Half painted Yoda sold separately. These for sale will need to be painted. I don’t know if this has been used or not. It appears to have never been removed from box when I opened it to take the photo. Either way I doubt someone would buy this to use, but nothing ever surprises me anymore. 3D Model Kit. sold in as you see condition. 1995 "STAR WARS" LUKE SKYWALKER VINYL MODEL. 1/6 SCALE MODEL. Mask is in great condition, the rubber band is broken and missing (but can easily be replaced). Plastic window on the box is partially detached. New in package. I bought a whole bunch of these in a lot, and I am selling the sets that were duplicates of ones my boyfriend already had. I combine shipping - so check out my other items for more great deals! Metal Earth models by Fascinations are amazingly detailed miniature models that are laser cut with precision. Each model is accurate down to the most minuscule details. Each model is made from completely flat, laser-etched steel sheets. From easy to expert levels of difficulty, Metal Earth models are great for novice to veteran modelists. HASBRO STAR WARS EPISODE II BLADEBUILDERS YODA And DARTH VADER LIGHTSABER’S. Condition is New. Shipped with USPS Priority Mail. Manufactured by AMT ERTL. This highly detailed vinyl model includes a display base and blaster. Disney Star Wars Foil Art Scenes - Disney Star Wars Foil Art Scenes. Just Peel & Press. The Empire pressed the shuttle into service for both cargo ferrying and passenger duty. Even the Empire's elite, like Darth Vader and the Emperor Palpatine used these shuttles. It has three wings: a stationary center foil and two articulated flanking wings. No Glue or Solder Needed. From Steel Sheets to Museum Quality 3D Model. 2 Sheets - Difficulty Level Moderate. Unassembled Model with Easy to Follow Instructions. No Glue or Solder Needed. From Steel Sheets to Museum Quality 3D Model. Unassembled Model with Easy to Follow Instructions. No Glue or Solder Needed. From Steel Sheets to Museum Quality 3D Model. No Glue or Solder Needed. From Steel Sheets to Museum Quality 3D Model. 2 Sheets - Difficulty Level Moderate. TITANIUM SERIES. THE BLACK SERIES. 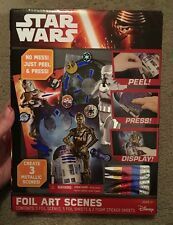 Rare 5 HASBRO STAR WARS BLADEBUILDERS YODA DARTH VADER REY ELECTRONIC LIGHTSABER All brand new in box! 2 darth 2 yoda 1 Rey Please look at pictures for further details and feel free to ask any questions. Good luck! Check out my other unique items up for grabs. No Glue or Solder Needed. They first appear in the Empire Strikes Back. AT-AT's are 50 feet tall and have the appearance of a giant four-legged monsters. From Steel Sheets to Museum Quality 3D Model. Star Wars Anakin Skywalker Extendable Lightsaber, See Description. Star Wars Anakin Skywalker Extendable Lightsaber. Revenge of the Sith. Condition is New. Shipped with USPS First Class Package. You get everything you see here! It's at least 50 little toys. They are depicted as the primary interceptor and dogfighter of the Rebel Alliance and the New Republic. No Glue or Solder Needed. From Steel Sheets to Museum Quality 3D Model. Unassembled Model with Easy to Follow Instructions. The two-legged transport, dubbed the scout walker by many, serves as a reconnaissance and patrol vehicle, often flanking approaching AT-ATs and mopping up infantry that sneaks past the larger walkers. Upon landing, the wings rise from flight mode and then retract, encasing the upper wings’ sensor arrays in thick armor. No Glue or Solder Needed. From Steel Sheets to Museum Quality 3D Model. Unassembled Model with Easy to Follow Instructions. The TIE Fighter has proved itself in battle, as it is capable of withstanding many direct hits. No Glue or Solder Needed. From Steel Sheets to Museum Quality 3D Model. Unassembled Model with Easy to Follow Instructions. It first appears in the first seconds of Star Wars and is the signature vessel of the imperial fleet. No Glue or Solder Needed. From Steel Sheets to Museum Quality 3D Model. Unassembled Model with Easy to Follow Instructions. Brand New - still in box. Rey (Starkiller Base) Electronic Lightsaber. Ages 4 & up. STAR WARS ROGUE ONE R1. WEIGHT: 4 Ounces. STAR WARS THE FORCE AWAKENS. WEIGHT:6.7 Ounces. New, packaging has some wear as pictured.